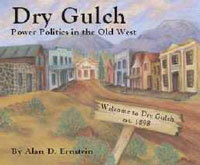 A trading game where players try to amass the most power by dominating the Wild West town of Dry Gulch. Dry Gulch casts players as the head of a family settling the Old West. You are trying to amass enough Power Points to be "elected" mayor of the town. Power Points are scored by being responsible for the development of the town through the construction of different types of buildings and the improvements of those buildings (by playing special Power Point Cards). The first player to have the required number of Power Points during their turn, wins the game.